On Sunday, I went to a house warming ceremony of a relative here in Hyderabad and I was chitchatting with some of my relatives and naturally, the discussion moved to the issue of separate Telangana state. Most of my relatives present there have moved to Hyderabad from Andhra after their adulthood and they still have that penchant for a single state even though they sold off their lands there and settled down here for good. Initially, I could able to justify separate Telangana to be carved our of Andhra Pradesh. But, when the topic moved towards the leaders, I became defensive and in the end had to admit defeat. Defeat not for separate state but who are the leaders who have the will and who can strive for the economic development of Telangana. Of all the list of leaders who are in the picture right now, none of them are eligible enough to lead Telangana. If one person has started the separate movement because he was not made Deputy Chief Minister, other person is into this only to try to prove a point and get himself as "President" of India while other person is trying to become Governor of a State and the list continues. None of them are here for the development of the state. They are here only to cash in the sentiments of Telangana people. Then I started looking at political parties on a whole. While the TRS, BJP and CPI are staunch pro-Telangana parties, Congress Party is in a "fighting mode" among its leaders while TDP and CPI(M) are completely against a separate state. TDP is saying that they will take "right decision at right time". Then I started narrowing on each party. Telangana Rashtra Samithi (TRS) was formed when its leader K. Chandra Sehkar Rao (KCR) was denied the post of Deputy Chief Minister by Chandrababu Naidu Telugu Desam Party (TDP) Government. Some opportunistic leaders from other parties jumped into TRS. TRS leader, Narendra (he has a RSS background and he jumped from BJP into TRS) started a militant wing thus scaring people on region wise. KCR distanced himself from this as he saw some hidden Hindu agenda and he is not ready to sacrifice important Muslim votes as almost 30% of Telangana is Muslim. Narendra broke away from this party and started a separate party. Latest update is that he is trying backhand to make a comeback to his parent party, the BJP. People consider TRS as more militant and violent since its inception. TRS leaders are said to be open boozers which doesnt give a good name to the party. BJP is the first national party which supported separate Telangana in their National Executive Meeting held at Kakinada (Coastal Andhra Pradesh) couple of years back. All their leaders are unanimous on the separation and they did their ground work really well. Their problem is they have only one legislature representing them in the 292 strong AP Assembly and they need to work hard in that direction. This party looks to have a better opportunity than other parties. Their parent, Rashtriya Swayam Sevak Sangh (RSS) is pretty strong in Telangana. If they want to push Telangana, then they need to start conducting meetings and awareness campaigns to keep the momentum till the assembly elections slated next year. The Communist Party of India (CPI) is only strong in couple of pockets in Andhra Pradesh and it cannot play a very important role in pushing for Telangana. The less said about Congress Party is the better. Recently, Telangana political heavy weights went to New Delhi for an audience with Sonia Gandhi (Congress Party President). She kept them waiting for a whole week inspite of the fact that some of the leaders worked with Congress since the days of Nehru and Indira Gandhi. They had to come back to Hyderabad fuming (??). After lot of pestering, she allowed them audience last week and reports said that she gave a class to them and told them to stop bickering and talking about Telangana as it would give a negative impact on the prospects of Congress in the next elections. These so called leaders have now started fighting among themselves. Telugu Desam Party (TDP) supremo, Nara Chandrababu Naidu rules it with an iron hand and doesnot let anyone to be second in command. There is no second rung leadership in the party and he never allowed dissidence in the party. While he balks about Democracy outside, he never let it happen inside his own party. Devender Goud, the TDP leader from Telangana had recently started to talk about Telangana. He is one of the most senior leaders of TDP. He was severely criticized by leaders from Andhra and Raayalaseema regions and even Naidu took a class of him. Internal democracy is completely put down in TDP and one day, it would only explode. The Communist Party of India (Marxists) are against smaller states. They worry that if they support small states, someday, they have to give away Gorkhaland - part of West Bengal state which is ruled by the communists with an iron hand past couple of decades. They are not ready to give away their strong hold. Before we expect a separate state, we need a good Leader to Lead us. The leader has to come out with a plan of action after achieving Telangana. Achieving Telangana is not a difficult task. What lay ahead is how to make sure it survives and beat the critics claims that separate Telaganites would eat rocks from the Deccan Plateau. Till then, asking for Telangana (leave alone demanding) looks to be like shooting ourselves in the foot. Kosovo, which is a part of Serbia declared independence from Serbia on 17th February 2008 with active support from America and its European allies France, Britain and Germany. This has divided the opinion of lot of world capitals and countries like Russia and China protesting and countries like Indonesia and Srilanka criticizing the independence declaration. Kosovo's contains 2 Million Muslim population of which 10% is Orthodox Christian. During the middle ages, Christian Serbia was on the borders with Muslim Turks and in the war, Turks converted Bosnians into Islam and crushed Serbs at the battle of Kosovo in 1389. The former Yugoslavia has crumbled and it is torn apart by internal strife and ethnic cleansing during the 1990's. Present day Slovenia, Croatia, Macedonia, Bosnia-Herzegovina, Montenegro and now the declaration of Independence by Kosovo !! While Serbia is right at getting pissed off as one part of it has broken the country, Russia is particularly angry as this independence declaration was immediately authenticated by the US and its cronies in Europe. Kosovo's declaration of independence has opened a Pandora's box where disputed regions throughout the world might start declaring independence and irresponsible countries like the US and its feet lickers in the Europe like Britain, France and Germany okaying whatever the US does. While China is worried by a similar action by Taiwan (China pledged that its army would walk into Taiwan the day it declares independence) and Xinziang area where Uighur Muslim rebels are fighting for a separate country and Tibet too is a problematic area. Srilanka is worried that LTTE might declare independence and even some world capitals okaying it. Indonesia had already lost East Timor and it's on the verge of losing Aceh too. Thailand is fighting its Muslim rebels in three of its southern provinces. Similar situations exist in Darfur region of Sudan and the Shan, Kachin and Rakhine (Arakan) provinces of Myanmar. Russia is already fighting a war with Muslim rebels in Chechnia, Dagestan and Ingusetia. While the Georgian and Armenian enclaves like Abkhazia, South Ossetia and Nagorno-Karabakh are fighting to merge with Russia. Pakistan is fighting with Pakhtoon Nationalists who want independence from Pakistani suppression. Closer Home, India is already fighting with Muslim extremists in Kashmir, Sikh extremists in Punjab , Christian and other ethnic extremists in the north east India. India has a lot to worry with this Independence declaration by Kosovo as this is been endorsed by the US and other European countries. What happens if in the future Kashmiri Separatists declare independence and some Muslim countries recognizing it ? Would US allow separation of Iraq along ethnic Sunni / Shia / Kurd regions ? Would England allow Northern Ireland to separate and give full political rights to the Catholic Irish community ? Sametime, would the US give separate country to its Indigenous Indians whom the Whites suppressed past many centuries ?? If they cannot do that, whey are they supporting separatist movements across the world ?? Did India forgot its North-East Part ?? Whenever I read news either in the daily newspapers or online, I hardly encounter news regarding the North-East India. For Everyone's information, North East India contains 7 sister states namely, Arunachal Pradesh, Assam, Manipur, Meghalaya, Mizoram, Nagaland and Tripura. These states are connected to the rest of India by a very small area of land, called as the Chicken Neck Area near Siliguri. This part is very very important for India as the Chinese border is just a few kilometers away. If they could able to choke this point, India loses its Eastern part. Is the Government of India serious about the Chinese incursions in the state of Arunachal Pradesh ? As the facts show, I dont think so !! There has been zero development in the area of infrastructure and the nearest border post is 4-5 walking days away. India deliberately kept these areas under developed so that there would be minimal outside traffic in these areas and it would be easy to identify outsiders. The Government had banned sale of lands to outsiders - "outsiders" means Indians who are not from the state !! There are lot of areas which are off limits to Indians themselves. Why is the Government doing this and thus alienating the people of North East ? This is a failed policy which every Government since the 1962 lost war with China has been following. On the other side, China had built huge infrastructure and most importantly, Railway Lines right near the McMahon Line bifurcating India and China. During future war, China can transport heavy military machinery within a day or two whereas India would be least prepared and has to forget about its north east part. Because of poor infrastructure, most areas of Tawang District are not been provided by essential commodities. Chinese Rice and grain is found in the possession of Indian grazers in the border areas provided by the Chinese authorities. Since India is not able to provide them, they are accepting it from the Chinese. The UPA Government is concentrating more on building up relationship with the US than China. Iam not saying we should move away from US but we have a real problem with China which sits on our borders. We need to quickly resolve all our conflict areas with China through constructive dialogue. Recently, Prime Minister Manmohan Singh visited Itanagar, capital of Arunachal Pradesh but he shied away from visiting Tawang as China considers Tawang as its territory in India's possession and thus "disputed". The Prime Minister was trying to please China. On one side, we are closely falling into the trap of United States in containing China and at the same time, we are trying to please China. This is a very bad foreign policy and it would some day affect us in a very negative manner. India should not become a pawn in containing China but India needs to compete with China in all aspects - Economic and Military !! Sametime, we need to develop our border areas by improving the infrastructure,Schools, Hospitals and Telecom Facilities. We should realise that if we lose Arunachal, we can forget about Kashmir. 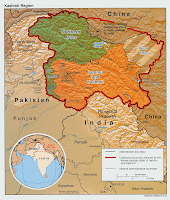 Look at the map of Jammu and Kashmir. Half is not in our possession (Aksai Chin, Azad Kashmir, etc). Within the other half, half is Ladakh and one third Jammu. What is left is an 80 km valley between Anantnag and Baramulla. This small territory (12 percent of the state), takes all the energies of the politicians and our resources. For, 60 years our minds have been devoted to this small area. At the same time, it is very unfortunate that a state of 84,000 sq km with the potential to provide 30 percent of the nation's energy is today ignored. It is unfortunate and it frustrates the youth of North East. Don't forget that Kashmir is claimed by a small country which does not economically or militarily match India, while Arunachal is claimed by a nation far superior to India. It is time to wake up. Once you lose Arunachal, you can forget Kashmir. If Arunachal goes, the damage will be irreparable. The people of India need to know the reality on the ground, they need to know China, the Himalayan region, the northeast and Arunachal. The rest of India does not pose any challenge for the nation. Unless we know what China is, India is not safe. It is hightime our policy makers in Delhi take a hard look at the facts and would help in developing the forgotten North East India. Losing trust on Congress Party and putting pressure on the Telangana Leaders of Congress Party, the Members of Parliament of Telangana Rashtra Samithi resigned from the Lok Sabha yesterday at New Delhi and the Members of Andhra Pradesh State Legislature resigned today at Hyderabad. 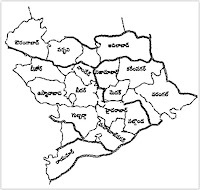 Please view the map of Nizam State (Hyderabad State) which was broken down into parts and some parts added into Maharashtra (Parbhani, Osmanabad and Aurangabad) while some parts merged with Karnataka (Raichur, Gulbarga and Bidar) and the remainder merged with Andhra State. On March 14th, Sonia Gandhi is opening the new Hyderabad Airport - longest runway in Asia. The name of the airport is Rajiv Gandhi International Airport. It has become common for the Congress Party regime in Andhra Pradesh naming every small building or project on the names of Rajiv Gandhi and Indira Gandhi as if there are not state leaders of high stature. The Congress Party planned to organize a massive public meeting addressed by Sonia Gandhi. But the high command today sent a message from New Delhi informing the State Congress that the meeting stood canceled. They are expecting trouble from TRS members coming to the meeting in the guise of Congress party members. Also, questions would be raised by congress members from Telangana region about separate statehood. To run away from answering awkward questions, the Congress Party canceled the public meeting. Instead, Sonia would be addressing a public meeting in Andhra region and flying directly to inaugurate the new airport and then taking a direct flight back to New Delhi. Such is the situation of the ruling party that its all India leader is fearing to address a public gathering in Hyderabad. This shows the pitiable situation the party is in. Why have the brought it to this extent ?? They fought previous elections cohabiting with TRS for a separate state. When they came into power, they are shying away from it, thus fooling those who voted them to power. This time round, people from Telangana Region should ensure a resounding defeat to Congress Party in Telangana. Then they will understand that they should never play with the sentiments of people.